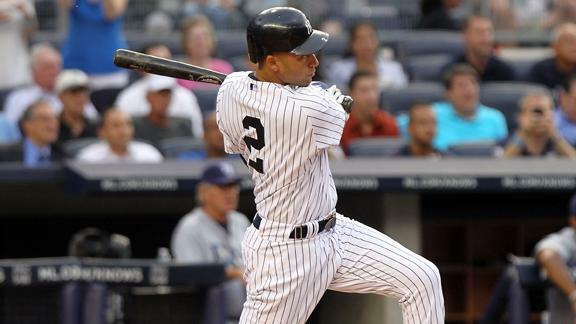 Congrats Derek Jeter – The Most Unlikely 3000th Hits. Derek Jeter got hit number 3000 today on a homerun. Wade Boggs is the only other guy to hit a homerun on hit 3000. Of the 27 (28 if you count Cap Anson) who have achieved 3000 hits, one player had a triple (Paul Molitor), seven players have had a double, and 17 have had a single. Of course, this information could have been gotten from any number of places on the internet, but the following table probably could only be seen here. Hit Number 2,998 or 2,997 or 2,996….. The table below measures the “likelihood” of the type of hit the player got as his hit number 3000. The hit probability column is easy to understand; it looks at the player’s 3000th and shows what percent of his hits has been that type. Hank Aaron’s 3000th hit was a single, and singles were 61% of his career hits. If only that column was used, the most likely hits would obviously be singles and the least likely, triples. However, the Relative Probability column tries to measure the likelihood of the 3000th hit type compared to all the other players on the 3000 hit list. A relative prob. of 100 means that the player has a likelihood of getting a particular type of hit that is equal to the 3000 hit club as a whole. By this measure, Hank Aaron had the most unlikely 3000th hit (65.0), relative to the distribution of his hits. Derek Jeter had a relative probability of 96.4, and Rod Carew, a singles hitter, had the most likely 3000th hit – a single. Related Post: Do Last Place Teams Have A Chance To Improve? – MLB Version. All Star Trivia: You Probably Didn’t Know This.